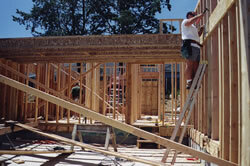 There is a world of difference between a luxury home builder and a regular contractor. A contractor may be competent to build a safe, quality structure, but it's an experienced specialized team that makes the best luxury home builder. Kachay Homes has a proud history of bringing the best in upscale living to its discriminating clients. Read the article below or visit these links. If you are looking for quality and luxury in a new home, you have come to the right place. At Kachay Homes, we pride ourselves in providing you with the highest quality materials the industry has to offer. As a luxury builder, we are distinguished from our competitors by our award-winning designs, luxury features, and numerous opportunities to personalize your home. When you walk through the front door of any Kachay home, you will be amazed to see how many ways you can add your personal touch to your new home. Kachay Homes established the vision that began in 1970 - to create a home building company with the financial and organizational strength to provide quality homes and service in a diverse array of neighborhoods throughout the nation. Over thirty-five years later, we have become the home building Company our founders envisioned, and the management at Kachay Homes has never lost sight of the most important truth of all - that continued success depends on the Company’s ability to please one customer at a time. Through our partnerships with nationally recognized name brand suppliers with reputations for excellence, you are assured both quality and value. Many talk value, quality, and luxury, but Kachay Homes actually delivers. By focusing on providing value through quality construction and design excellence for each of our home buyers, our Company has become an acknowledged industry leader. That is why with over three decades in the business, we still measure our success by the satisfaction of one home buyer at a time.